For the ethnography of Europe, see Peoples of Europe. For the populations of Europe by country and the population overall, see Demographics of Europe. Most languages of Europe belong to the Indo-European language family. Out of a total population of 744 million (as of 2018), some 94% are native speakers of an Indo-European language; within Indo-European, the three largest phyla are Slavic, Romance and Germanic, with more than 200 million speakers each, between them accounting for close to 90% of Europeans. Smaller phyla of Indo-European found in Europe include Hellenic (Greek, c. 10 million), Baltic (c. 7 million), Albanian (c. 5 million), Indo-Aryan (Romani, c. 1.5 million) and Celtic (including Welsh, c. 1 million). Of the approximately 45 million Europeans speaking non-Indo-European languages, most speak languages within either the Uralic and Turkic families. Still smaller groups (such as Basque and various languages of the Caucasus) account for less than 1% of the European population between them. Immigration has added sizeable communities of speakers of African and Asian languages, amounting to about 4% of the population, with Arabic being the most widely spoken of them. The Indo-European language family is descended from Proto-Indo-European, which is believed to have been spoken thousands of years ago. Early speakers of Indo-European daughter languages most likely expanded into Europe with the incipient Bronze Age, around 4,000 years ago (Bell-Beaker culture). Slavic languages are spoken in large areas of Central Europe, Southern Europe and Eastern Europe. An estimated 250 million Europeans are native speakers of Slavic languages, the largest groups being Russian (c. 110 million in European Russia and adjacent parts of Eastern Europe, Russian forming the largest linguistic community in Europe), Polish (c. 55 million), Ukrainian (c. 40 million), Serbo-Croatian (c. 21 million), Czech (c. 11 million), Bulgarian (c. 9 million), Slovak (c. 5 million) Belarusian and Slovene (c. 3 million each) and Macedonian (c. 2 million). West Slavic includes Polish, Czech, Slovak, Lower Sorbian, Upper Sorbian and Kashubian. East Slavic includes Russian, Ukrainian, Belarusian, and Rusyn. South Slavic is divided into Southeast Slavic and Southwest Slavic groups: Southwest Slavic languages include Serbo-Croatian and Slovene, each with numerous distinctive dialects. Serbo-Croatian boasts four distinct national standards, Bosnian, Croatian, Montenegrin and Serbian, all based on the Eastern Herzegovinian dialect; Southeast Slavic languages include Bulgarian, Macedonian and Old Church Slavonic (a liturgical language). Roughly 215 million Europeans (primarily in Southern and Western Europe) are native speakers of Romance languages, the largest groups including French (c. 69 million), Italian (c. 65 million), Spanish (Castilian) (c. 40 million), Romanian (c. 23 million), Portuguese (c. 10 million), Sicilian (c. 5 million, also subsumed under Italian), Catalan (c. 4 million), Galician (c. 2 million), Sardinian (c. 1 million), Occitan (c. 500,000), besides numerous smaller communities. The Romance languages are descended from varieties of Vulgar Latin spoken in the various parts of the Roman Empire in Late Antiquity. Latin was itself part of the (otherwise extinct) Italic branch of Indo-European. Romance is divided phylogenetically into Italo-Western, Eastern Romance (including Romanian) and Sardinian. The Romance-speaking area in Europe is often referred to as Latin Europe. 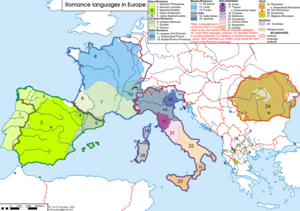 We can further break down Italo-Western into the Italo-Dalmatian languages (sometimes grouped with Eastern Romance), including the Tuscan-derived Italian and numerous local Romance lects in Italy as well as Dalmatian, and the Western Romance languages. The Western Romance languages in turn separate into the Gallo-Romance languages, including French and its varieties (Langues d'oïl), the Rhaeto-Romance languages and the Gallo-Italic languages; the Occitano-Romance languages (East Iberian), grouped with either Gallo-Romance or West Iberian, including Occitan, Catalan and Aragonese; and finally the West Iberian languages (Spanish-Portuguese), including the Astur-Leonese languages, Galician-Portuguese and Castilian. The Germanic languages make up the predominant language family in northwestern Europe. An estimated 210 million Europeans are native speakers of Germanic languages, the largest groups being German (c. 95 million), English (c. 70 million) and Dutch (c. 24 million), Swedish (c. 10 million), Danish (c. 6 million) and Norwegian (c. 5 million). There are two extant major sub-divisions: West Germanic and North Germanic. A third group, East Germanic, is now extinct; the only known surviving East Germanic texts are written in the Gothic language. West Germanic is divided into Anglo-Frisian (including English), Low German and Low Franconian (including Dutch) and High German (including Standard German). Yiddish is a Jewish language developed in Germany and shares many features of High German dialects and Hebrew. Low German (including Low Saxon) is spoken in various regions throughout Northern Germany and the North and East of the Netherlands. It is an official language in Germany. It may be separated into Low Saxon (West Low German) and East Low German. Dutch is spoken throughout the Netherlands, northern Belgium, as well as the Nord-Pas de Calais region of France, and around Düsseldorf in Germany. In Belgian and French contexts, Dutch is sometimes referred to as Flemish. Dutch dialects are varied and cut across national borders. Scots, spoken in Scotland and Ulster. The Frisian languages are spoken by about 500,000 Frisians, who live on the southern coast of the North Sea in the Netherlands and Germany. These languages include West Frisian, Saterlandic, and North Frisian. Italiot Greek is, debatably, a Doric dialect of Greek. It is spoken in southern Italy only, in the southern Calabria region (as Grecanic) and in the Salento region (as Griko). It has been studied by the German linguist Gerhard Rohlfs during 1930s and 1950s. Albanian has two major dialects, Tosk Albanian and Gheg Albanian. It is spoken in Albania and Kosovo, neighboring North Macedonia, Serbia, Greece, Italy and Montenegro. It is also widely spoken in the Albanian diaspora. The Indo-Aryan languages have one major representation, it being Romani (c. 1.5 million speakers), introduced to Europe in the late medieval period. The Iranian languages in Europe are natively represented in the North Caucasus, notably with Ossetian. Armenian speakers came to Russia in significant numbers after the First World War due to Armenian genocide and dissolution of the Ottoman Empire (see below). Uralic is native to northern Eurasia. Finno-Ugric groups the Uralic languages other than Samoyedic. Finnic languages include Finnish and Estonian. The Sami languages are closely related to Finnic. The Ugric languages are represented in Europe with the Hungarian language, historically introduced with the Hungarian conquest of the Carpathian Basin of the 9th century. The Samoyedic Nenets language is spoken in Nenets Autonomous Okrug in the far northeastern corner of Europe (as delimited by the Ural Mountains). Oghuz languages in Europe include Turkish, spoken in European Turkey and by immigrant communities; Azerbaijani is spoken in Azerbaijan and parts of Southern Russia and Gagauz is spoken in Gagauzia. Kypchak languages in Europe include Crimean Tatar, which is spoken in Crimea; Tatar, which is spoken in Tatarstan; Bashkir, which is spoken in Bashkortostan; and Kazakh, which is spoken in Kazakhstan. Oghur languages were historically indigenous to much of Eastern Europe; however, most of them are extinct today, with the exception of Chuvash, which is spoken in Chuvashia. The Basque language (or Euskara) is a language isolate and the ancestral language of the Basque people who inhabit the Basque Country, a region in the western Pyrenees mountains mostly in northeastern Spain and partly in southwestern France of about 3 million inhabitants, where it is spoken fluently by about 750,000 and understood by more than 1.5 million people. Basque is directly related to ancient Aquitanian, and it is likely that an early form of the Basque language was present in Western Europe before the arrival of the Indo-European languages in the area in the Bronze Age. North Caucasian languages is a geographical blanket term for two unrelated language families spoken chiefly in the north Caucasus and Turkey—the Northwest Caucasian family (including Abkhaz and Circassian) and the Northeast Caucasian family, spoken mainly in the border area of the southern Russian Federation (including Dagestan, Chechnya, and Ingushetia). Kalmyk is a Mongolic language, spoken in the Republic of Kalmykia, part of the Russian Federation. Its speakers entered the Volga region in the early 17th century. Maltese is a Semitic language with Romance and Germanic influences, spoken in Malta. It is based on Sicilian Arabic, with influences from Italian (particularly Sicilian), French, and, more recently, English. It is unique in that it is the only Semitic language whose standard form is written in the Latin script. It is also the smallest official language of the EU in terms of speakers, and the only official Semitic language within the EU. Cypriot Maronite Arabic (also known as Cypriot Arabic) is a variety of Arabic spoken by Maronites in Cyprus. Most speakers live in Nicosia, but others are in the communities of Kormakiti and Lemesos. Brought to the island by Maronites fleeing Lebanon over 700 years ago, this variety of Arabic has been influenced by Greek in both phonology and vocabulary, while retaining certain unusually archaic features in other respects. In the Middle Ages the two most important defining elements of Europe were Christianitas and Latinitas. Thus language—at least the supranational language—played an elementary role[clarification needed]. The earliest dictionaries were glossaries, i.e., more or less structured lists of lexical pairs (in alphabetical order or according to conceptual fields). The Latin-German (Latin-Bavarian) Abrogans was among the first. A new wave of lexicography can be seen from the late 15th century onwards (after the introduction of the printing press, with the growing interest in standardizing languages). The concept of the nation state begins to emerge in the early modern period. Nations adopted particular dialects as their national language. This, together with improved communications, led to official efforts to standardise the national language, and a number of language academies were established (e.g., 1582 Accademia della Crusca in Florence, 1617 Fruchtbringende Gesellschaft in Weimar, 1635 Académie française in Paris, 1713 Real Academia Española in Madrid). Language became increasingly linked to nation as opposed to culture, and was also used to promote religious and ethnic identity (e.g., different Bible translations in the same language for Catholics and Protestants). 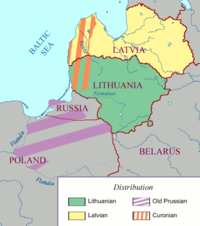 Polish, due to the Polish–Lithuanian Commonwealth (16th–18th centuries). Historical attitudes towards linguistic diversity are illustrated by two French laws: the Ordonnance de Villers-Cotterêts (1539), which said that every document in France should be written in French (neither in Latin nor in Occitan) and the Loi Toubon (1994), which aimed to eliminate anglicisms from official documents. States and populations within a state have often resorted to war to settle their differences. There have been attempts to prevent such hostilities: two such initiatives were promoted by the Council of Europe, founded in 1949, which affirms the right of minority language speakers to use their language fully and freely. The Council of Europe is committed to protecting linguistic diversity. Currently all European countries except France, Andorra and Turkey have signed the Framework Convention for the Protection of National Minorities, while Greece, Iceland and Luxembourg have signed it, but have not ratified it; this framework entered into force in 1998. Another European treaty, the European Charter for Regional or Minority Languages, was adopted in 1992 under the auspices of the Council of Europe: it entered into force in 1998, and while it is legally binding for 24 countries, France, Iceland, Italy, North Macedonia, Moldova and Russia have chosen to sign without ratifying the convention. The main scripts used in Europe today are the Latin and Cyrillic. The Greek alphabet was derived from the Phoenician alphabet, and Latin was derived from the Greek via the Old Italic alphabet. In the Early Middle Ages, Ogham was used in Ireland and runes (derived the Old Italic script) in Scandinavia. Both were replaced in general use by the Latin alphabet by the Late Middle Ages. The Cyrillic script was derived from the Greek with the first texts appearing around 940 AD. Around 1900 there were mainly two typeface variants of the Latin alphabet used in Europe: Antiqua and Fraktur. Fraktur was used most for German, Estonian, Latvian, Norwegian and Danish whereas Antiqua was used for Italian, Spanish, French, Polish, Portuguese, English, Romanian, Swedish and Finnish. The Fraktur variant was banned by Hitler in 1941, having been described as "Schwabacher Jewish letters". Other scripts have historically been in use in Europe, including Phoenician, from which modern Latin letters descend, Ancient Egyptian hieroglyphs on Egyptian artefacts traded during Antiquity various runic systems used in Northern Europe preceding Christianisation, and Arabic during the era of the Ottoman Empire. The European Union (as of 2016) had 28 member states accounting for a population of 510 million, or about 69% of the population of Europe. The European Union has designated by agreement with the member states 24 languages as "official and working:" Bulgarian, Croatian, Czech, Danish, Dutch, English, Estonian, Finnish, French, German, Greek, Hungarian, Irish, Italian, Latvian, Lithuanian, Maltese, Polish, Portuguese, Romanian, Slovak, Slovenian, Spanish and Swedish. This designation provides member states with two "entitlements:" the member state may communicate with the EU in the designated one of those languages and view "EU regulations and other legislative documents" in that language. The European Union and the Council of Europe have been collaborating in education of member populations in languages for "the promotion of plurilingualism" among EU member states, The joint document, "Common European Framework of Reference for Languages: Learning, Teaching, Assessment (CEFR)", is an educational standard defining "the competencies necessary for communication" and related knowledge for the benefit of educators in setting up educational programs. In a 2005 independent survey requested by the EU's Directorate-General for Education and Culture regarding the extent to which major European languages were spoken in member states. The results were published in a 2006 document, "Europeans and Their Languages", or "Eurobarometer 243". In this study, statistically relevant samples of the population in each country were asked to fill out a survey form concerning the languages that they spoke with sufficient competency "to be able to have a conversation". The following is a table of European languages. The number of speakers as a first or second language (L1 and L2 speakers) listed are speakers in Europe only;[nb 1] see list of languages by number of native speakers and list of languages by total number of speakers for global estimates on numbers of speakers. The list includes any language or dialect with an ISO 639 code; this means that some communities of speakers within a macrolanguage may be listed more than once, e.g. speakers of Austro-Bavarian listed both separately (under bar) and subsumed in the total given under "German" (de). Recent (post-1945) immigration to Europe introduced substantial communities of speakers of non-European languages. The largest such communities include Arabic speakers (see Arabs in Europe) and Turkish speakers (beyond European Turkey and the historical sphere of influence of the Ottoman Empire, see Turks in Europe).Armenians, Berbers and Kurds have diaspora communities of c. 1–2 million each. The various languages of Africa and languages of India form numerous smaller diaspora communities. ^ "Europe" is taken as a geographical term, defined by the conventional Europe-Asia boundary along the Caucasus and the Urals. Estimates for populations geographically in Europe are given for transcontinental countries. ^ Sovereign states, defined as United Nations member states and observer states. 'Recognised minority language' status is not included. ^ a b c d The Republic of Kosovo is a partially recognized state (recognized by 111 out of 193 UN member states as of 2017). ^ a b c d e f g Recognized and protected, but not official. ^ "International migrant stock: By destination and origin". United Nations. .
^ Friedman, Lawrence; Perez-Perdomo, Rogelio (2003). Legal Culture in the Age of Globalization: Latin America and Latin Europe. Stanford University Press. ISBN 0804766959. ^ "Linguist makes sensational claim: English is a Scandinavian language". ScienceDaily. Retrieved 2016-03-06. ^ Alexander, Marie; et al. (2009). "2nd International Conference of Maltese Linguistics: Saturday, September 19 – Monday, September 21, 2009". International Association of Maltese Linguistics. Retrieved 2 November 2009. ^ Aquilina, J. (1958). "Maltese as a Mixed Language". Journal of Semitic Studies. 3 (1): 58–79. doi:10.1093/jss/3.1.58. ^ Aquilina, Joseph (July–September 1960). "The Structure of Maltese". Journal of the American Oriental Society. 80 (3): 267–68. doi:10.2307/596187. ^ Werner, Louis; Calleja, Alan (November–December 2004). "Europe's New Arabic Connection". Saudi Aramco World. Archived from the original on 2012-09-29. Retrieved 2016-02-05. ^ Counelis, James Steve (March 1976). "Review [untitled] of Ariadna Camariano-Cioran, Les Academies Princieres de Bucarest et de Jassy et leur Professeurs". Church History. 45 (1): 115–116. doi:10.2307/3164593. ...Greek, the lingua franca of commerce and religion, provided a cultural unity to the Balkans...Greek penetrated Moldavian and Wallachian territories as early as the fourteenth century.... The heavy influence of Greek culture upon the intellectual and academic life of Bucharest and Jassy was longer termed than historians once believed. ^ Wansbrough, John E. (1996). "Chapter 3: Lingua Franca". Lingua Franca in the Mediterranean. Routledge. ^ a b Calvet, Louis Jean (1998). Language wars and linguistic politics. Oxford [England]; New York: Oxford University Press. pp. 175–76. ^ Jones, Branwen Gruffydd (2006). Decolonizing international relations. Lanham, MD: Rowman & Littlefield. p. 98. ^ Darquennes, Jeroen; Nelde, Peter (2006). "German as a Lingua Franca". Annual Review of Applied Linguistics. 26: 61–77. doi:10.1017/s0267190506000043. ^ "European Charter for Regional or Minority Languages: Strasbourg, 5.XI.1992". Council of Europe. 1992. ^ "Languages Policy: Linguistic diversity: Official languages of the EU". European Commission, European Union. 4 June 2009. Retrieved 9 August 2015. ^ "Languages of Europe: Official EU languages". European Commission, European Union. 2009. Archived from the original on 2 February 2009. Retrieved 5 November 2009. ^ "Common European Framework of Reference for Languages: Learning, Teaching, Assessment (CEFR)". Council of Europe. Archived from the original on 30 October 2009. Retrieved 5 November 2009. ^ "Europeans and Their Languages" (PDF). European Commission. 2006. p. 8. Retrieved November 5, 2009. ^ Toso, Fiorenzo (2006). Baldini & Castoldi (ed.). Lingue d'Europa. La pluralità linguistica dei Paesi europei fra passato e presente. Roma. p. 90. Retrieved July 6, 2015. ^ P. Bruni, ed. (2004). Arbëreshë: cultura e civiltà di un popolo. ^ "Ethnologue: Albanian, Arbëreshë". Retrieved October 29, 2014. ^ a b III Sociolinguistic Study of Asturias (2017). Euskobarometro. ^ (in French) VI° Enquête Sociolinguistique en Euskal herria (Communauté Autonome d'Euskadi, Navarre et Pays Basque Nord) (2016). ^ a b c d e Europeans and their Languages Archived 6 January 2016 at the Wayback Machine, Data for EU27, published in 2012. ^ Le Statut spécial de la Vallée d'Aoste, Article 38, Title VI. Region Vallée d'Aoste. Archived from the original on 4 November 2011. Retrieved 2 May 2014. ^ recognized as official language in the Nordfriesland district and in Helgoland (§ 82b LVwG). ^ includes: bar Bavarian, cim Cimbrian, ksh Kölsch, sli Lower Silesian, vmf Mainfränkisch, pfl Palatinate German, swg Swabian German, gsw Swiss German, sxu Upper Saxon, wae Walser German, wep Westphalian, wym Wymysorys, yec Yenish, yid Yiddish; see German dialects. ^ STATUTO SPECIALE PER IL TRENTINO-ALTO ADIGE (1972), Art. 99–101. ^ N. Vincent, Italian, in B. Comrie (ed.) The world's major languages, London, Croom Helm, 1981. pp. 279-302. ^ "Consiglio regionale della Calabria". www.consiglioregionale.calabria.it. ^ SIL Ethnologue: "Not the dominant language for most. Formerly the main language of Sephardic Jewry. Used in literary and music contexts." ca. 100k speakers in total, most of them in Israel, small communities in the Balkans, Greece, Turkey and in Spain. ^ About 10 million in Kazakhstan. Kazakh at Ethnologue (18th ed., 2015). Technically, the westernmost portions of Kazakhstan (Atyrau Region, West Kazakhstan Region) are in Europe, with a total population of less than one million. ^ Contemporary Latin: People fluent in Latin as a second language are probably in the dozens, not hundreds. Reginald Foster (as of 2013) estimated "no more than 100" according to Robin Banerji, Pope resignation: Who speaks Latin these days?, BBC News, 12 February 2013. ^ The question whether Low German should be considered as subsumed under "German" as the official language of Germany has a complicated legal history. In the wake of the ratification of the European Charter for Regional or Minority Languages (1998), Schleswig-Holstein has explicitly recognized Low German as a regional language with official status (§ 82b LVwG). ^ Whitehead, Sarah (2 April 2015). "How the Manx language came back from the dead". theguardian.com. Retrieved 4 April 2015. ^ "Montenegro". Ethnologue. Retrieved 2018-04-29. ^ In 2008, law was passed by the Region of Campania, stating that the Neapolitan language was to be legally protected. "Tutela del dialetto, primo via libera al Ddl campano". Il Denaro (in Italian). 15 October 2008. Archived from the original on 27 July 2011. Retrieved 22 June 2013. ^ "Norwegian". Ethnologue. Retrieved 2018-08-06. ^ Occitan at Ethnologue (18th ed., 2015). includes Auvergnat, Gascon, Languedocien, Limousin, Provençal, Vivaro-Alpine. Most native speakers are in France, their number is unknown, as varieties of Occitan are treated as French dialects with no official status. ^ Piedmontese was recognised as Piedmont's regional language by the regional parliament in 1999. Motion 1118 in the Piedmontese Regional Parliament, Approvazione da parte del Senato del Disegno di Legge che tutela le minoranze linguistiche sul territorio nazionale - Approfondimenti, approved unanimously on 15 December 1999, Text of motion 1118 in the Piedmontese Regional Parliament, Consiglio Regionale del Piemonte, Ordine del Giorno 1118. ^ Constitution of Kosovo, p. 8. ^ "Româna". unilat.org (in Romanian). Latin Union. Retrieved 2 April 2018. ^ a b L1: 119 million in the Russian Federation (of which c. 83 million in European Russia), 14.3 million in Ukraine, 6.67 million in Belarus, 0.67 million in Latvia, 0.38 million in Estonia, 0.38 million in Moldova. L1+L2: c. 100 million in European Russia, 39 million in Ukraine, 7 million in Belarus, 7 million in Poland, 2 million in Latvia, c. 2 million in the European portion of Kazakhstan, 1.8 million in Moldova, 1.1 million in Estonia. Russian at Ethnologue (18th ed., 2015). ^ mostly Northern Sami (sma), ca. 20,000 speakers; smaller communities of Lule Sami (smj, c. 2,000 speakers) and other variants. Northern Sami at Ethnologue (18th ed., 2015), Lule Sami at Ethnologue (18th ed., 2015) Southern Sami at Ethnologue (18th ed., 2015), Kildin Sami at Ethnologue (18th ed., 2015), Skolt Sami at Ethnologue (18th ed., 2015), Inari Sami at Ethnologue (18th ed., 2015). ^ GVG § 184 Satz 2; VwVfGBbg § 23 Abs. 5; SächsSorbG § 9, right to use Sorbian in communication with the authorities guaranteed for the "Sorbian settlement area" (Sorbisches Siedlungsgebiet, Lusatia). ^ Tat at Ethnologue (18th ed., 2015), Judeo-Tat at Ethnologue (18th ed., 2015) 2,000 speakers in the Russian Federation according to the 2010 census (including Judeo-Tat). About 28,000 speakers in Azerbaijan; most speakers live along or just north of the Caucasus ridge (and are thus technically in Europe), with some also settling just south of the Caucasus ridge, in Transcaucasia. ^ c. 11 million in European Turkey, 0.6 million in Bulgaria, 0.6 million in Cyprus and Northern Cyprus, not including several million recent immigrants to Western Europe (see #Immigrant communities). ^ A motion to recognise Venetian as an official regional language has been approved by the Regional Council of Veneto in 2007. "Consiglio Regionale Veneto – Leggi Regionali". Consiglioveneto.it. Retrieved 2009-05-06. ^ Arab diaspora, mostly in France, Italy, Spain, Germany, UK, Sweden, Belgium, Netherlands, Denmark, current size unknown due to the European migrant crisis of 2015–present. ^ Germany: 1,510k, France: 444k, Netherlands: 388k, Austria: 197k, Russia: 146k, UK: 99k, Switzerland: 44k, Sweden: 44. ^ See Turks in Europe: only counting recent (post-Ottoman era) immigration: Germany: 4 million, France: 1 million, UK: 0.5 million, Netherlands: 0.5 million, Austria: 0.4 million, Switzerland, Sweden and Russia: c. 0.1.-0.2 million each. ^ 830k in Russia (2010 census), 100k in Ukraine (SIL Ethnologue 2015). ^ 1-2 million Armenians in Russia. France 250-750k, Ukraine 100k, Germany 100k, Greece 60-80k, Spain 40k, Belgium 30k, Czechia 12k, Sweden 12k, Bulgaria 10-22k, Belarus 8k, Austria 6k, Poland 3-50k, Hungary 3-30k, Netherlands 3-9k, Switzerland 3-5k, Cyprus 3k, Moldova 1-3k, UK 1-2k. ^ Kurdish population: mostly Kurds in Germany, Kurds in France, Kurds in Sweden. ^ Sylheti: 300k in the UK, Bengali: 221k in the UK. ^ see British Indian, Bangladeshi diaspora, Bengali diaspora. ^ [[Azerbaijani diaspora ]]: Russia 600k, Ukraine 45k, not counting c. 0.4 million in Azerbajjan's Quba-Khachmaz region, technically in Europe (being north of the Caucasus watershed). ^ Kabyle people in France: c. 1 million. ^ Germany 120k, Russia: 70k, UK 66k, Spain 20k. ^ Overseas Chinese: France 0.7 million, UK: 0.5 million, Russia: 0.3 million, Italy: 0.3 million, Germany: 0.2 million, Spain: 0.1 million. ^ UK: 269k (2011 census). ^ Pakistani diaspora, the majority Pakistanis in the UK. ^ see Uzbeks in Russia. ^ UK: 76k, Sweden: 74k, Germany: 72k, France 40k. ^ Iranian diaspora: Germany: 100k, Sweden: 100k, UK: 50k, Russia: 50k, Netherlands: 35k, Denmark: 20k. ^ UK: 101k, Germany: 35k, Switzerland: 22k. ^ Tamil diaspora: UK 300k, France 100k, Germany 50k, Switzerland 40k, Netherlands, 20k, Norway 10k. ^ Somali diaspora: UK: 114k, Sweden: 64k, Norway: 42k, Netherlands: 39k, Germany: 34k, Denmark: 21k, Finland: 19k. Reissmann, Stefan; Argador, Urion (2006). "Luingoi in Europa" (in Esperanto, English, and German). Reissmann & Argador. Archived from the original on 22 June 2009. Retrieved 2 November 2009.